Miva helps a local New York wine retailer increase sales, improve reporting, and boost customer satisfaction. 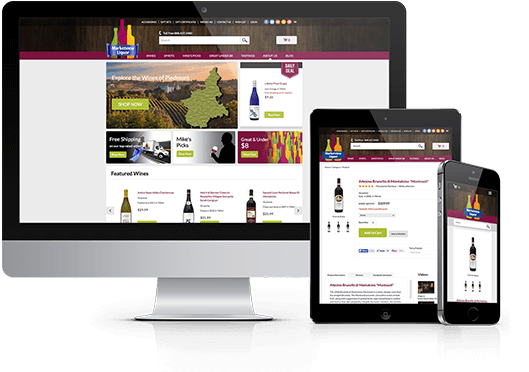 After nearly 7 years of rampant bugs, limited reporting, and SEO disasters on a homegrown ecommerce platform, wine retailer Marketview Liquor needed a stable, scalable ecommerce platform that could grow along with their online needs. With conversion rates and SEO rankings suffering, a platform change was increasingly a topic of conversation. Marketview Liquor built a successful business by leveraging its outstanding team of Customer Service and Wine Specialists to provide an exemplary user experience – but a buggy website with limited functionality was severely impeding the ability for Marketview to serve customers online. The length of time it took to release new features, coupled with limited reporting that impacted Marketview's ability to aid customers who called in with order problems, began to take a toll. In addition, major development initiatives would often come with significant consequences. During one particular update, a developer's oversight caused Marketview's Google rankings to plunge, essentially requiring them to completely restart all SEO efforts, significantly impacting sales. After looking at Magento and other major players in the ecommerce space, Marketview chose Miva, a complete ecommerce platform that has powered over $100 Billion in online sales since 1997, as their long-term ecommerce solution. Tom VanGorder, Marketview's director of online operations, found that Miva's fully configurable and scalable solution was able to meet Marketview Liquor's needs faster and more completely than any other platform he evaluated. "At the end of the day," he says, "it came down to the fact that I really liked the people at Miva and they gave me confidence that Miva was the best platform for our future." Miva's implementation included a variety of out-of-the-box functionality that immediately boosted business, including giving Marketview's customers the ability to easily access their purchase history, re-order based on past orders, and check on the status of pending deliveries, boosted conversion rate and site wide transactions. Marketview worked with Miva's professional services group to customize a "Shop as Customer" feature along with improved reporting that has enabled Marketview's phone operators to now provide the type of outstanding customer service indicative of the Marketview brand. In addition, Marketview now enjoys seamless updates and quick development turnaround times. Marketview Liquor has seen significant improvement in key metrics on Miva's platform. "The first thing we saw," VanGorder says, "was that our conversion rate jumped right out of the gate. We went from 1.75% to 2.14% immediately." For the first two complete months on the new site, site-wide transactions were up 37%, average order value was up 7%, and revenue was up 46% compared to the previous year on their old website. But for VanGorder, it's about the bigger picture. "The website is such an important part of our company's growth," says VanGorder, "and with Miva we feel like we're positioned for success."